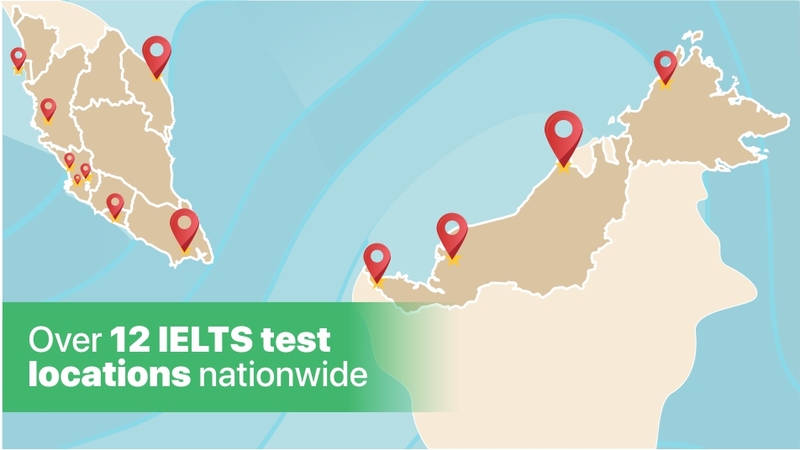 With more than 12 public test venues available nationwide, we offer the most comprehensive test venue network coverage in Malaysia. Selected test sessions are now with all skills tested on the same day - Speaking, Listening, Reading and Writing, to save your time. Register for paper-based IELTS with us today and enjoy a free IELTS Preparation pack in USB flashdrive with four (4) practice tests to help you be better prepared. During registration, enter a complete and valid mailing address in Malaysia for the IELTS Preparation Pack to be delivered to. Enter the promo code IELTS-PrepUSB in the ‘Promotion code (if applicable)’ box under the ‘Fill in optional data’ page when you register for paper-based IELTS test online. Promotion is valid from now until 30 April 2019. You will receive an IELTS Preparation Pack by registered post within 14 working days (dependent on external courier services) upon successful test registration. Practice with the IELTS Preparation Pack and feel ready for your IELTS test! Don’t miss it. Register for IELTS today! For enquiries, please contact us on +603 2723 7900 or at info@britishcouncil.org.my. This promotion is only applicable for test takers who register online for the paper-based IELTS test, using the promo code IELTS-PrepUSB. Or register in person at the British Council Penang centre. Upon successful test registration (online), eligible test takers will receive an IELTS Preparation Pack in a USB flashdrive by registered post within 14 working days (dependent on external courier services). For successful test registration in person at British Council Penang centre, test takers will receive an IELTS Preparation Pack in a USB flashdrive by hand. All redemptions are on a first-come-first-served basis and strictly while stocks last. This promotion is not applicable for any computer-delivered IELTS test registration. British Council reserves the right to change the type of courier services dependent on availability without prior notice. The courier delivery of IELTS Preparation Pack in USB flashdrive is limited to valid mailing addresses within Malaysia. While British Council will do their best to ensure timely delivery of the IELTS Preparation Pack in USD flashdrive to the eligible test takers, British Council will not be held responsible for any unsuccessful delivery due to invalid mailing address, lost courier, force majeure or any third party intervention. British Council does not warrant the quality and performance of the courier delivery process and shall not be responsible for any consequence in connection with the promotion and/or redemption and thereafter. British Council reserves the sole and absolute right to withdraw, amend and/or alter any part of the whole terms and conditions in relation to this promotion at any time without giving any prior notice to the candidates and the candidates agree to be bound by those changes. British Council shall not be liable for any claims by the candidates or third-party claims or loses of any nature, including but not limited to, loss of profits, punitive, indirect, special, incidental, or consequential damages or for other damages and any related claims of any nature, including direct, indirect, third-part, consequential or other damages resulting from or in connection with this promotion. British Council reserves the right of final decision in case of any dispute.